When I read the blurb for Berserker, I was immediately intrigued. Norse mythology and Vikings have always been subjects that I have been interested in. I thought (actually still think) that the Viking society was fascinating. I also think that Norse mythology is fascinating too. When I saw that the different powers that Hanne has are a gift to from the gods, I needed to read this book. I am glad I did because Berserker is a book that was well worth my time reading. Berserker starts off in Norway. Hanne is a simple farm girl who has a horrible secret. If she sees anyone that she loves harmed in any way, she flies into a killing state. That state is called a Berserker and the Vikings from which Hanne is descended from made the term famous. Hanne is able to keep her gift a secret until she witnesses her father being murdered. It is then that she flies into Berserker mode and kills the men who murdered her father. With her mother long gone, it is up to Hanne’s older brother to keep the family together. When Hanne’s younger brother is accused of the murders, Hanne decides that traveling to America is the only way to keep him out of jail. It is also the only way to keep their powers secret. But, there are outside forces who are searching for the siblings. And they have the means to capture the kids and return them to Norway. The question is, will they? Or will Hanne and her siblings be able to settle in America and live out their lives in peace? I felt awful for Hanne for about 90% of the book. Her family feared and loathed her. Which was not right. She had no control over what powers she would get. It was an unlucky roll of the dice that she got Berserker. Hanne needed reassurance from her parents, not for both of them to turn their backs on her. Even her siblings feared her. They also blamed her for their mother leaving. I wanted to reach through the book and hug her, I felt that bad for her. But, once she got to America, she started to change. She started coming out of her shell and started realizing that she could learn to control her powers. It was a very powerful thing to read. I loved how the author wove the fantasy and historical elements of this book together. It made the book so very interesting to read. I could picture myself on the train with the Norse immigrants. I could see them being treated like 2nd hand citizens because of how they were dressed. I could see myself with them as they crossed the Atlantic on a ship. And when they had to go through Ellis Island to be allowed into the country. I do have a gripe with Berserker. It was the storyline with Rolf, Ketil and their mission for the Baron to gather more Nytteson. The Nytteson were people who had powers like Hanne and her brothers. It as not resolved and that bugged me. The author did attempt to end it with Rolf but I was left very dissatisfied. The end of the book was fantastic. Actually, the word I am thinking of here is wild. Everything that transpired in the ending was intense. I did think what happened to Ketil was very fitting. I also had my reservations about Rolf. With the way the book ended, I am hoping that a book 2 is in the works. I would love to read it. Berserker is an intense fantasy, historical fiction, young adult book. It had a great plot. It also had great characters. This is a book that I could see myself reading over and over. Why: Violence. Other than some graphic scenes of people being killed, the book is very clean. 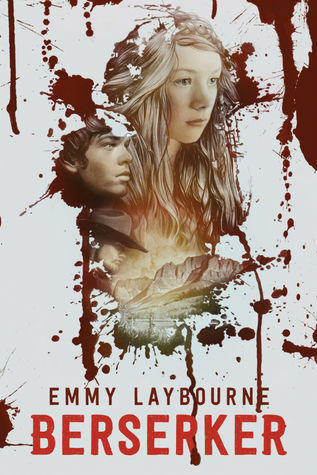 I would like to thank Emmy Laybourne, Macmillian Children’s Publishing Group, Feiwel & Friends, and NetGalley for allowing me to read and review Berserker.